Tennessee military parenting rights issues include Navy, Army, Marines, Air Force and Coast Guard concerning service members stationed at the Naval Support Facility Mid-South near Millington, Tennessee, Fort Campbell, an army base that straddles the Tennessee and Kentucky border, and their families living in the Memphis, Germantown, Collierville, and Bartlett areas. Courts have long recognized that divorcing parents have rights to parenting time with their children. In most cases, one becomes the residential parent, while the other is the nonresidential parent.Divorce agreements or orders will mandate the nonresidential parent’s right to child visitation, and any agreement or order can be modified if the residential parent petitions the court to move out of state. Naturally, members of the military will frequently be called upon to move during his or her career, sometimes far away, and this can call for repeated modifications to child visitation schedules. Visits that used to occur two or three times a week might change to visits of a week or so every other month or more to accommodate the service member’s military obligations. When the member of the military is the residential parent and is faced with deployment or assignment that does not allow the children to tag along, the nonresidential parent could be named the residential parent for that period. Custody of the children could also be granted temporarily to a family member of the service member. Despite state laws that dictate that a residential parent that may be in place, the custodial rights of a military parent coming back from deployment, say, could be challenged by the noncustodial parent. If the residential parent is a member of the military who’s been reassigned and wants to take the children along, the courts will look at this matter closely, because it will not want to deprive the nonresidential parent of the right to visit with the children. This could certainly be the case if the residential parent is moving with the children across the country or to another country. The courts will also be very concerned about whether they can exercise jurisdiction over the military custodial parent. If a residential parent in the military takes his or her child out of the country without permission of the courts, this could result in the courts taking away residential rights and award them to the nonresidential parent. Keep in mind that while the courts will work hard to protect the parenting rights of both residential and nonresidential parent, their most important concern will be what’s in the best interests of the children—that can trump all other considerations. 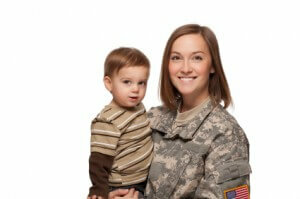 Despite state laws that may be in place, the rights of a military parent still may be challenged. With child custody being such an important issue, it is vital that you discuss your situation with an attorney who has handled these types of cases.